If you have to choose between MS Word and Pages you should also take advantage of using iCloud file sharing which makes things a lot easier when you're on-the-go. I realized that I do not need to spend a lot of money on MS Office bundle having Macs in my company and my employees told me they prefered Pages to Word, so it made them work more comfortably which resulted in better workflow. "Pages is Perfect for our Business!" We like how Pages allows us to edit website content prior to uploading on our website. Since we use Macs mostly in our business, Pages is a free alternative to editing on Microsoft Word for our website content. Pages allows us employees to send documents to each other, while allowing us to extract images, which is extremely helpful as well. Pages also allows us to edit content on iCloud, so if we are working on a different Apple device, we can still see the same changes made on a previous device on the same iCloud account. We dislike how Pages is not fully compatible with Microsoft Word documents. We also dislike how documents created with newer versions of Pages cannot be opened with older versions of Pages. No matter if the document would be compatible or not, newer Pages documents are restricted in older versions of Pages, which is frustrating and annoying. When using Pages, we would recommend others to save and share documents in "Pages" format, always keeping your version of Pages updated. This way, you'll be able to see your employees' content in the way they intended to send it. Pages allows us employees to send website drafts to each other for our business, while allowing us to extract image files to use in Wordpress! Pages helps us quickly view website revisions when needed, without having to pay for and download Microsoft Office (for Microsoft Word). Pages also allows us to edit draft content on all of our Apple devices. "Great tool if you like straightforward and beautiful writing experience"
"Just as easy as Word to use!" I like the fact that Pages works just as well as MS Word. It does take a bit of getting used to to find your bearings, but once you got that down, the rest is easy! I think the learning curve is a bit discouraging to some people. I was a bit frustrated in the beginning of learning this product. Other than that, it's a great software package! i would recommend giving Pages a try. I believe that if you stick to it, you will actually like Pages better than using MS Word. I primarily use Pages for my print projects and writing articles. Pages has some great layouts and templates that make it easy to create content in a format that is pleasing to the eye. It is simple to use to design brochures, handbooks, posters, flyers, etc. I use it all the time for my work to create different promotional material. It is accessible to putting images in your projects too. Some of the design and formatting of the documents can be fidgety. And there is limited function for some images and creating new documents and projects. It really is only for Apple Macbooks. There needs to be a Pages program designed for Windows and PCs because anyone that doesn't have the program cannot even open the files. Make sure everyone in your office uses a Apple Macbook otherwise Pages would be useless to any Windows/PC user. But you can export to a PDF but you wouldn't be able to edit the document. We use Pages for everyday promotional use for our office. We use it for our programming flyers and brochures. It is easy to save and export and send off to a printer to print materials. Works really well between Apple products. I'm a big fan of the publishing/export options offered in Pages. The ability to export ePub, PDF, Pages, Word, and even Rich and Plain Text for documents I've created is a huge benefit. If I could change anything about the software, it would be the limitation of there not being a native application for Windows users. While I do not personally use Windows, I do collaborate with a few individuals who do. The workaround of the web based iCloud.com version of Pages is an acceptable but not fantastic solution. Seeing as it's a free piece of software with nearly all of the features I would want or expect from desktop word processing applications, it solves many problems I face on a daily basis, not the least of which is collaborating on eBook projects across multiple authors. The collaboration features and familiar interface have made it very easy to create rich content for the individuals I teach. "The best program for classic eBook creation! " As a designer, I love that Pages allows you to create sophisticated layouts. Achieving the same design in any other program would take twice as long and in some instances, it's impossible to recreate. The functionality is amazing! I love use shapes and especially image masks and instant alpha. They are truly indispensable features. For me, sharing a document is a little cumbersome, but it's not the software's fault! I grew up on Apple, but not many of my colleagues know how to use the program, which makes collaboration an issue. The ability to turn your Pages files into word documents is a life saver, but once opened in Microsoft Office, it may look a little different sometimes. But as I mentioned, it's no fault of the program! Since pages was created by Apple, using it is similar to using other Apple software. Once you explore and get used to the product, navigation is a breeze. Make sure that colleagues are also using the program (if you will be collaborating). Most people never really take advantage of the cloud features, which you may want to explore! Pages allows me to create stunning eBooks (usually shared as a PDF document). I am able to (once again) create bookmarks of particular sections and link within the document. I can also add external links as well. A benefit for me, as a designer, is that the layout and design functionalities are so simple and easy to use. "Cheap and preferred to Microsoft Publisher"
I like the ease of overlaying objects, the way you can use their ‘symbols’ and change the colors and textures in a more modern style. I like that I can convert to page layout and I find it easier to adjust simple settings than similar products. I also like that I can access my pages documents between devices with great ease. I don’t like that the text box link feature (which I’m glad they added back after several versions with out) does not allow you to have the text boxes in different orders on the page- for instance, if I am creating a booklet that I want to lay out on a half letter sheet, I can’t order the text boxes in the necessary diagonal format. I also don’t like that the color eyedrop feature has some glitch that either delays it from working for about 30 seconds or causes the application to crash altogether. Booklet design. Bulletins for church Sunday services. "Amazing! The ONLY text editor you may need. " I love the simplicity. It's so light but at the same time, so versatile. I write content for a blog, SEO articles, various posts, drafts and even emails. All of this is done inside Pages. After switching to Mac from Windows, of course I was used to Word. But that's only because Microsoft made the world use Word as a standard. I was afraid I would have to use Microsoft Word on the Mac, but no. Apple made is a breeze for everyone. It's pre-installed on my Mac as a default app and it works incredibly smooth. To be honest, there's not much you can dislike. It's almost perfect for me. The only thing I'd request to improve is the way Pages works with images that you drag and drop inside. Sometimes it doesn't work as expected and the pictures you paste inside just disappear. Don't blink. Just use Pages. It's the only text editor you will need on a Mac. You can export the files as any popular format you may imagine. As a software company that creates apps and has frequent product launches – we have to create Press Releases, website copy, blog posts, SEO articles and more. All of this is done using Pages. We never had a problem. I highly recommend just using Pages without having to worry about buying additional text editing software. There are also various templates that we use to create reports and newsletters. "A fast way to build documents and research papers on the go." Pages is scaled well for mobile platforms. I use a IPad Pro, a MacBook Pro and an IPhone 8. I can work on the same document without worrying about transfer. Each platform is scaled well for the time of use. I might start a document on my IPad, and write out most of the long narratives, but then I can at in my images from my laptop (or any of the devices) and i can pick up where i left off at on my cell phone. It would be wonderful if pages or the IOS platform could include a faster method for “snipping” in documents/images and other visual aids for the development of proposal and white papers. This is great to use for the consultant or business advisor who is writing a regular volume of white paper essays and needs something lightweight to start writing projects. I write most of my white papers through this program,... and then transfer into a permanent format to Adobe. I like how easy/fast it is to export. What I like best about Pages is that it combines the features of a word processing program like Microsoft Word with the intuitive layout functions of an Adobe product. While Pages will never be as sophisticated as a product like InDesign, it is darn close. AND it is significantly less expensive and easier to use. You can use Pages to turn out everything from letters to layouts, pages to posters, and essays to eBooks. It's ability to handle the addition of graphics, media, colors, and styles is unlike any product I've seen. The best part is that I can drag and drop whatever I need into a document, change colors using rgb formulas or even hexadecimal web values, and add paragraph styles, character styles, and drop shadows with ease. Throw in the fact that Pages reads Word files and saves files as Word or PDF and you have an all-in-one solution that works on your computer, your tablet, and even on your phone. There are sometimes glitches when you open Word files. I think this is more because of Microsoft's fussiness and over complication than any shortcoming in Pages. However, sometimes opening Word files in Pages can require some clean up and adjustment to the formatting. Do it! You won't regret the switch. It may require a little adjustment period if you're used to the over-complication of Word, but you'll be off to the races in no time. I use Pages for all of my word processing needs. I also find that it is easier and more intuitive to teach others to use Pages than it is to teach them Word. "Very comfortable to use, no pressure"
The template and default style looks good. The Style is easy to use, custom style works well. The UI is clear and easy to understand. It's Free on both macOS and iOS. Not work well with .doc and .docx, It's not Apple's fault but most people use Microsoft Office and you have to work with them. the mix of picture and text sometimes make me confuse. sometimes change one picture and everything after that mess up. It's easy to learn, easy to use, and have a good look UI. more lightweight than Microsoft Word. If you do not need to work with Word user in same document very much, It's fun and happy to use, and easy to get a good look document. and now It's free both on macOS and iOS, so why not have a try. Write technical documents and product brochures, typesetting is very effictient. finally, avoid scenes that work with people who use Word. "A Great Replacement For MS Word"
It's a fast and lightweight yet powerful word processor with plenty of features including collaboration and both an iOS and a web version for when you're away from your Mac. And the best part? it's free with every new Mac! Nothing. Honestly, I can't think anything that I don't like about it. I love it! There's no reason to spend money on MS Office apps or on Word when you can use Pages, which is a free download to new Mac owners. With web-based and iOS companion apps and iCloud integration, it's an excellent solution for your word processing needs. I use pages for writing any documents I need, including any that require low-level page layout, but not enough to require InDesign. the biggest benefit, other than it being free with my Mac is that it's so well integrated with both iCloud and the iOS and web-based companion apps that I can be working on a document on my iMac at home, get up, walk out the door, and get on the subway, and continue working on it on my iPhone or iPad, then finish it on my Mac at work, and I can do all of this seamlessly and easily, whereas, if I were using MS Word (or any other app), this entire process would be far more difficult and expensive. "Pages is an excellent resource for Mac & Word doc users alike"
I love the customization that Pages offers, and the fact that you can transfer it to a .doc extension format. I also love the fact that it keeps the format, for the most part, when you change the extension of it. I also like the variety of template uses for it; basic, stationary, newsletter, etc. The pages version still has a long way to go, but I think it's on the right track, since Apple is always evolving technologically, and they are on top of the game. I'll always be a Mac user, and it will be my go to resource always. We are not solving business problems with Pages yet, as there are too many PC users with GGM, but as far as those who use Mac pages along with me, the benefits are more streamlined and seamless. "Versatile and often-overlooked design app"
Pages is a versatile word processor with a great capability for professional design. It has simple layout features that make it ideal for small budgets and does not have a massive learning curve. Pages has some template limitations and can be finicky with some of the more business-oriented word processing functions like mail merge. You do need to own at least some form of Apple hardware in order to use Pages, which is worth considering when looking to either purchase or switch to Pages. Additionally, this is not a great substitute for the collaborative aspects of word processing – version management is somewhat challenging, and I it's not as streamlined to edit in the cloud. I also recommend attending a Pages overview at a nearby Apple Store if you are unfamiliar with the features, as I found those to be incredibly helpful when getting acclimated to the product. I have used Pages primarily as an inexpensive replacement for Adobe InDesign to design programs, labels, and brochures for nonprofit organizations. While I would not recommend it within the professional design space per sé, I find that many people aren’t aware of its awesome capacity for design. Masked images, text character spacing, and even image background elimination are all possible and well-designed in this app. "All 'Round Easy & Efficient"
I enjoy the easy navigation for formatting and exporting. Pages has taken out the many tabs that Microsoft Word has and replaced it it one large tab on the side of the page. Their navigation on the top is also easy to find and work with. I also love how easy it is to share with anyone, especially fellow Mac users. I also appreciate how you can export your document to a PDF, Word, Plain text, and etc. Overall, the theme of this application is: EASY for anyone, anytime, anywhere. While it is easy to navigate and use, one must also consider what is left out. I have grown up using Microsoft Word and know the ins and outs of that program. So when utilizing Pages for my work (especially when it comes to documenting shots and graphics), I find that the formatting options are at a minimum. While it's not a must have, if you are looking for a program with advanced formatting options, stick with Word and forego Pages. Again, if you're looking for a program that is easy to use and navigate through, I highly suggest Pages. If you are looking for a more advanced formatting software, I'd suggest researching further and doing a compare and contrast of programs. I primarily use Pages for documenting shot descriptions and graphic specifics for the videos that I work on. Although the formatting options are bare bones, it has just enough to keep my videos and graphics organized. It also allows me to quickly share it with anyone within the company. Benefits: Ease of use, Navigation, Simplicity, Sharing, Efficient. The advantage of using Pages is the sharing of documents between the various apple devices available to the user (for example mac, ipad, iphone) and the simplicity of the basic commands for the creation of text documents. Compared to the historical competitor Microsoft Word, some commands are less intuitive and sometimes you have to search for a long time between the various menus to find the specific function. The most important disadvantage in the workplace is the proprietary format .pages, which does not allow a fluid passage of documents, as many people do not work on the Mac. In the workplace it works well to create simple documents and sharing can be guaranteed by exporting in pdf format or even more technological formats such as epub. However, the epub format requires many additional changes to be considered a good document. "Pages is just as easy as Word"
I love my Mac, but wasn't sure about using Pages when I got my new Mac after having had a PC prior to this purchase. But I've come to love it. And it's easy to take any Pages document and save it as my two favs - a Word document or PDF document. Once I learned the tools, like how to switch between format and document, it was easy. And the more I use it, the easier it gets. I did have to learn (the hard way) that once you make a change in Pages, it automatically converts it to that new change, even if you didn't save it. I figured out that I have to hit the Edit, Undo button repeatedly if I already changed something and wanted to save the 'original' version too. But, now that I know that, I know what to do. Don't worry about using any other word program...Pages will do everything you need for word processing. I use Pages for business and personal reasons. I use it every day when I come home to do my IEPs and other Special Education paperwork. I use it for our timeline tables and letters to parents. It's my everyday go-to for word processing. "Good Basic Program but Has Serious Limitations"
Pages is easy to use, with a shallow learning curve. As well, fairly instantaneous syncing through iCloud makes documents available on all devices signed in to a given Apple ID. In recent years, Apple has so simplified and streamlined the program as to make it unusable (by me) for certain functions (ie book design) that I used it exclusively for in the past. This is a great basic writing/design program. But if you need more advanced features (eg better kerning, "facing pages" format), this may not be the program for you. This is a great basic writing program that competes easily with MS Word, as long as you don't need some more advanced features. Some of those features were included with earlier versions of Pages but have, unfortunately, been dropped from more recent versions. All the different projects I've used Pages for. Obviously, it's primarily word processing, but I've used it for graphics and editing things that I can't edit in my normal program. Pages is incredibly versatile and incredibly easy to use. Once in a while it has been a little glitchy for me. Use it for as many things as possible. It's an incredibly versatile program, and I use it 7 days a week. Other than that, I don't really have any other recommendations--it's just a great program, and I recommend using it for whatever you can. I write sermons, do text studies, create and format Bible studies, and create worship folders. It's so easy to integrate all sorts of images, fonts, shapes, and other items. "Many people overlook Pages, which is a shame as it is a versatile, powerful word processor"
Pages is one of the few Word processing applications that works with Mac OS X's built in autocorrect. This is a huge time save, as it avoids having to do a spell check when you have finished typing. Of course, it can sometimes lead to mixed-up words. But Pages also works with Mac OS X's built in text-to-speech tool, so a quick run through that and you can often catch most mistakes. Pages is fully integrated with iCloud, so you can access your documents anywhere or on any machine that has a web browser. If using an Apple device, you can access documents via a dedicated Pages app which keeps things nice and snappy. For all other platforms you have to use a browser. The browser version can sometimes have a slight delay when flicking between pages, but aside from that, it is very well done and is just as good as using the actual app. Pages has everything you need to create a Ebook. You can export your document into a Ebook with just a single click. There are also options to add cover images to the Ebook version and you can keep the cover image separate from all other versions of the document, which allows plenty of flexibility in using the same document for multiple projects. -Paragraph Stylesheets, which makes it easy to change the formatting of text at a global level. -Character Stylesheets, which makes it easy to handle formatting overrides. -Bookmarks: Make it easy for users to flip through different sections (very handy when making Ebooks). You can assign keyboard shortcuts to most of these functions, which saves more time. However, some of the shortcuts have limits. For example, for Style Sheets, you can only assign them to a function key. 5: It's free to use with free updates! This is a big advantage over Word which has a monthly subscription fee. (You can also buy Word outright, but then you don’t get new versions for free). With Pages all new versions are free as well! Unlike a lot of word processors on Mac, Pages is lightning fast. It opens in split seconds and you can move through pages with no delays. Although you can assign keyboard shorts cuts to most functions, a very small minority of them will not work. You can create tables in Pages and they look just like tables from Numbers (Apple's spreadsheet program). But the keyboard keys for editing are different from Numbers which can be annoyingly confusing. Apple normally only adds new features once a year. This isn't too bad as the software already has everything most people need. But a faster pace of innovation would be nice. 4: Spell checker can be weak. Spell checker sometimes gives wrong suggestions. It is a shame that it doesn't integrate with Google spellcheck. Give it a try. It's free and perfect for anyone who needs to make documents or simple ebooks. iCloud integration means I can access my documents anywhere. It's very fast to create an ebook and then publish it on Amazon kindle. Mac services like Dictionary, Thesaurus can all be accessed from Pages. Google Docs: Doesn't work with Mac autocorrect, so typing is a pain due to having to correct typos. Word: Expensive for what it is. Open office: Takes a while to load. No cloud integration. I like the ease of use that comes with Pages. I have used Word before, but Pages is much more user friendly in my opinion. It's also extremely easy to integrate graphics into documents which can be tricky in other word processors. My only dislike with the Pages program is that there aren't as many users as there are with Word or other word processors, so it can be tricky to send documents to others unless it is sent as a pdf. I highly recommend Pages as it is very easy to navigate and learn. I use it for many different purposes such as creating menus, signs, and forms for printing, as well as media for posting online. If you like to incorporate images into documents, Pages makes that extremely easy. I also appreciate how simple it is to add new fonts into the font library for use in Pages and other related programs like Keynote and Numbers. We are currently using Pages to create menus for our shop, as well as signs to display within the shop and digital copies to post on social media. I enjoy being able to easily integrate images into my documents, as well as charts and tables. "Review for Pages by Apple"
Pages is very user friendly. Even a person who is less tech-savvy than myself could figure it out instantaneously. This software works for people who have a hard time with Microsoft Word. Everything is easy to find and you can even export into any file type. There aren't any formatting errors either. Well, if you want to do something more complicated than your basic run of the mill table or essay you will need to consult Apple tutorials or support pages for assistance. An example of something that I had to consult a tutorial about was how to remove all of the hyperlinks in a document at once. It didn't make sense to remove them individually as there were over 100 hyperlinks in the table that I was creating. I use pages when I want to create tables for character development. These tables are used to flush out the details of the characters that I am making for my stories. I also use tables to write my stories and back when I worked for the campus newspaper, I would use pages to gather the articles from the editors in order to place them in the inDesign file. "A little more user-friendly than MS Word." Using Pages is pretty simple and far less frustrating than using MS Word can be, and I say that as someone who's been using a Mac for less than 2 years (I was exclusively PC-based up until recently). It's not incredibly difficult to figure out where things are, menus don't seem to change with updates, and it doesn't take 1000 steps to reformat something. The .pages format isn't compatible with Word, but it's easy to save a .doc version. I'm also having to get used to some keyboard shortcuts not existing in Pages that do in Word. I use pages to compose and share blog post drafts, primarily, but also use it for tracking daily work, generating lists for ideas, and other word-processing-heavy things. "Pleasantly surprised by my new word processor"
It is so intuitive and user friendly. It is also graphically pleasing to look at in general which helps me focus on what I am doing/writing! It has covered all my basic needs that I use as far as a word processor. Formatting is good in it as well. I have had trouble exporting the file so people using microsoft word can open/edit the file. I have been exporting it as a PDF to send to other people. It was free and came with my computer! I cannot justify spending the money on microsoft word at this time, and although I was generally pleased with OpenOffice, I have liked Pages SO MUCH MORE so far! I find it much more efficient, therefore saving me time, and time is money! "Pages - Free alternative to MS Word"
- Collaboration. If you use iCloud Drive several users can edit this files like in Google Docs. Share files with different rights. - a lot of templates. You can find examples of resumes, school reports, etc. - collaboration works. But’s it’s working not as good, as Google Docs. It's great free altenative to MS Word, you don't need to buy Office if you need simple DOCs editing tool. Also you can collaborate with your team and edit files like in Google Docs via iCloud Drive. If you need simple tool to edit DOC and DOCx files - you are good to go. Right now Google Docs also can solve this tasks, but Pages can do collaboration too. A huge plus of Pages is templates. It's very easy to do Reports with simple and good looking design. Not much other than it is a free app with an Apple computer. The URL ends in .pages which hardly anyone can open. I constantly need to export to a Word doc and that takes three or four steps to do it. There aren't as many options as Word has for formatting. I'd much rather use Google Docs or MS Word. For all the years I've had Pages in my Apple computers, even sending to others that have it, asks if I can convert my document to Word or share through Google Doc. "Pages is an Affordable Alternative to Word"
I appreciate that Pages comes free with the purchase of any Macintosh computer and is equipped to handle basic word-processing needs. I dislike that the formatting in Pages is less user-friendly than it is in other word processing applications like Microsoft Word. For example, to change the margins of a document, clicking "format" in the top menu will get you nowhere. Clicking "file" and then "page setup" gets you nowhere, also. Remember that Pages is a basic program. It is best if viewed as a temporary substitute for Microsoft word unless you are willing to put in the time to learn its inner workings. As we are all equipped with MacBook Air computers, Pages is accessible to everyone at my workplace. It is a uniform system that allows issues to be approached in similar ways. I like that the interface is very clean and organized and that it is very easy to navigate. Compared to Microsoft word, Pages has almost none excessive buttons on the surface. I use it mostly for writing and reviewing academic text. Pages make it very easy to add and view comment. I especially like that when I read a revised text, I can choose to accept the change or not. I also like that now I can use it on my iPad Pro. And most importantly, Pages if free now with your purchase of an Apple computer. I think that the file format can be a little complicated if you don't pay attention and didn't export it to a word file or a pdf file, because most of office I work with still use Microsoft Word. I hope that I can choose to save it as a word file instead of having to save it as page file and export it to another file format. Also, the way page automatically save your changes can cause some problem if you want to undo your change. "Pages: A Robust Yet Often Underrated Word Processor"
When it comes to word processors, the one that’s most commonly used is Microsoft Word, especially in business settings. The choice of word processors can be related to the popular brands for certain generations. In the 1980s, Brothers was popular, in the 1990s Microsoft reigned, and now Google’s products are making their way into large organizations. However, I feel that Pages is often overlooked. Pages is on Mac and in previous decades most companies haven’t used Macs instead they relied on PCs. So, it makes since that Pages isn’t as popular, at least from my experience. However, Pages has a lot of perks. I find it slightly similar in some ways to Adobe InDesign but a more affordable alternative. When you open Pages you have the choice of a number of templates to use and they’re placed on black background, which makes the designs stand out more. Although, you have a list of choices, you can actually think outside-of-the box with the high quality templates that are provided. For example, you can use one of the flyers as a mock-up ad page, a case study, or a webpage and you can combine flyers or use the Digital ebook to create a whitepaper or a quarterly report. You can print a PDF of the document and then turn it into a beautiful HTML web page. The basic templates note-taking, which I tend to use a lot and because it helps you to jump right into recording notes. The layout is a perk because unlike Microsoft where you have to navigate your mouse upward to dropdown menus. Pages makes places everything on the right hand side which makes accessing tools quicker and you can see the status of your layout and more. I like that you are able to export the document in several ways like PDF, Word, RTF and ePub. The ePub option gives you the option to easily publish the content as book or even a magazine. I think the icons and emojis should be more accessible and linked to additional options on the web or in the App Store. Right now, you have to access it under the Edit menu as opposed to Insert. I would recommend using Pages for a design heavy document that you would like to produce. I would suggest using the preformatted templates. Consider downloading “Toolbox for Pages” in the App Store which offers you a wide variety of options. I have used Pages for taking notes and preparing a series of letters and resumes. I have to admit that I don’t use Pages as often as I could or should. It’s more for documents where you would want to incorporate more designs. "Pages beats Word for this non profit 9/10 times"
Pages is part of the Apple ecosystem, so if you don't use Apple, then you probably need to move to Word. That being said, if you use Apple and are ignoring Pages for your word processing, you are really missing out! Pages does collaboration so well for our team. Whether MacBook Pro, Air, iMac, iPad Air 2, Mac mini, iPad mini, iPad 4th gen, iPhone 5, 5S, 6S, or 7, my team can collaborate with Pages. Those devices are being used regularly with Pages. For myself, I can start a Pages doc on my MB Air and pick it up on my iPad Air 2 or iPhone 7 in seconds! I speak every week to large and small groups of people. I use Pages on my iPad Air 2 to speak directly from. No need for another app. I can share my Pages docs with my PC loving treasurer on his Surface Pro by simply clicking "share" and transforming it into a Word Doc or PDF for him in seconds. I wished the publishing aspects were a little more developed, but simple flyers, posters, etc. are very easy to produce. I highly recommend Pages for Apple users! Speaking engagements are a breeze. When making a new document, it is easy to use. When editing someone else's work, I like that I can efficiently make changes and save as a new document. When making changes that are not just in the writing, the program is not intuitive. Adding images was difficult before I tried various ways in order to find the correct one. The layout often gets messed up when editing if the font does not exist or the image was placed incorrectly, and it's difficult to know how it'll look on someone else's computer. It doesn't save images properly. For us, specifically, it provides us with an efficient way to collaborate on documents since our employer uses Pages for all documents. We aren't quite solving any business problems, but we are running our business through the use of Pages and it's aid. We are a company that creates many documents and this program allows us to do that. "Free alternative to MS Word for Mac users"
- You have high quality templates for diffrenet kind of reports, resumes, etc. Good free alternative to MS Word, but with huge plus - online collaboration with collegues using ICloud drive. "As Efficient as Word if you learn it"
I just like that it is an Apple produced- product because it costs money for Mac users to purchase/use Microsoft Word. However, the general public seems to prefer MW because it's whats most commonly used. However, Pages is quite easy to learn and just as good once you use it on a regular basis. I dislike the unfamiliarity of it. I am used to Microsoft Word so it was difficult to learn at first. However, after spending a good amount of time with it, it works just as well. I would recommend pages to Mac users, it crashes a lot less than MW. MW often crashes on my Macbook whereas I've never had that problem with Pages. "The Surprisingly Effective Graphics Tool"
Pages is not just for word processing (although it does that well too.) The true beauty of Pages is that you can switch to Page Layout mode and do the equivalent of a Microsoft Publisher. The word processing ability of Pages is slightly below that of Word. I found the interface with fonts and sizes to be a bit confusing. If you are looking for a way to do some very basic graphics design projects, particularly for a small company that cannot hire a professional or afford expensive software, Pages is the place to go. Most people in my office use Macs because they are just so good at so many things. Their versatility is unparalleled and they are a good entry point for beginners with regards to technology. "If you need to create super professional and clean documents, use Pages"
With limited artistic talent or vision, I can create proposals and documents that look quite amazing. The native templates and color schemes are really well thought out and far better than other word processors. While it opens and edits word documents fine, I'd love the ability to edit a word document while keeping the word format and extension. While it exports really well, it seems like a save as would be nicer. If you don't do a lot of work on legal documents which need to have changes tracked, use pages. You'll put out a better document that looks better and is easier to format. You can still open word documents and export a word version of your document if you need. If you are a heavy collaborator when you create documents its not near google Docs but it's slowly getting there. We use this for proposals that need to look professional and put us ahead of other proposals that may look a bit boring because the typical office suite was used.
" Pages is my number one word processor." I like that Pages word processor comes preinstalled with my Macbook an iPad.Like most Apple products,Pages is intuitive and so easy to use.I like the multimedia options I am provided with ,as a Page user.I like how I am able to save documents created with Pages as a pdf file.A vital part of my love for Pages is how it enable me save my documents on iCloud. I dislike the fact that native a Page documents cannot be exported and accessed on either Google docs or Microsoft word. Pages is my default word processor.It is free,since it comes preinstalled on my MacBook and IPad.I use pages to create proposals,jot down notes and do everything I used to do with Msword. "Pages - Great Alternative to Microsoft"
I have not had this application crash on me - ever! Coming from a Microsoft user I have been accustomed to saving my documents a million times over or relying on the auto-save backup. With this, I haven't had to worry about it and have never lost a document I had spent lots of time and effort on. If you are used to using Microsoft products it may feel a bit foreign to you in terms of easily formatting your text. It has many similar capabilities but takes some digging to find how to use them. Take your time to learn all of the functions. I am still learning all functions since coming from Microsoft products and finding that they are indeed comparable. It may be missing a few things you are used to with Word but the important functions are there. Efficiency and streamlining - having everyone use Pages and other Mac products so that we are all working in the same stream. In terms of business problems, time-saving in fear of losing valuable documents. "Using Apple's Pages for School and Classroom use"
Pages is compatible with word, exports directly to pdf format, and is more user friendly than ms publisher. I use Pages as my go-to software when I need to create signs and visual aids for my classroom. Recent updates have seriously slowed my 2012 MacBook Pro. I would definitely try both Microsoft Publisher and Adobe Illustrator to find the one you like best. I'm primarily an Apple user, so the interface is very familiar for me. I also like the page layout option, as it is easier to manipulate and position images for posters and newsletters. I am a classroom teacher, and prefer to create my own materials, as opposed to buying them from stores or Teachers Pay Teachers (TPT). I use Pages to create posters, signage, and learning materials for my classroom. "Effective Program for creating documents"
I love pages, I use it often when I am making documents on my personal Apple computer for work. 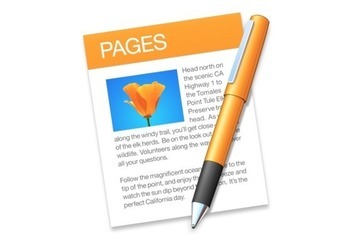 Pages is a brilliant option for users of Apple computers or mobile products. Pages provides a cost effective option for creating business documents on my personal computer. It saves me from having to purchase Microsoft Office for my personal computer. It’s such a simple and powerful word processing tool. I love all of the options it gives me to create exactly what I’m imagining! Nothing really. I think it’s an excellent software and for what I use it for works great! Great software! Comes with any apple product and free to use! If I need to write out anything formal to give to a customer I use this software and it works great! "For the person who wants simplicity "
I like the simple face of the program. You can start writing without feeling overwhelmed by the formatting options like you do with Word at the top. I love the ease of putting in a table and adding media. Highlighting is not as easy with this program and assumes you want to comment on anything you highlight. I write up all my proposals and documents on pages. My favorite benefit is easily transporting to PDF so my documents are seen with ease in email attachments by non-apple users. I also use this to make newsletters for print and send official letters to supporters with our logo on Pages. "Pages is better then Microsoft Word!" I love the seamless use between devices. I write a sermon on Pages on my Mac and I can use the document on my iPad to preach later on which is something I can't do in Word. ALSO, it's FREE with macOS and iOS! When you don't export the file as a document no one (that doesn't have a Mac with pages) can open it. I'm becoming more productive in my sermon and lesson writing process which is a must because every week I struggle to find the time to get everything done I need to do in week. Apple's Pages app has all the word processing bells and whistles one needs (WITHOUT changing the dang menu itself all the time, which is MADDENING) ... and ... it does nearly all the page layout one would need ... and ... is able to export files in a variety of formats. Plus ... it's just baked into the MacOS, so it plays nice with all its other little baked in friends. I dislike the fact that not *all* files exported to <.docx> look exactly the same as native Word files of that type, but understand the reasons for it. Not just working outside the clichéd box of word processing (MSWord) and page layout (InDesign), but - again - advantages gained by having features native to the MacOS are both wonderful and well-known. "Good alternative to Word for Mac computers"
I like the ease of using Pages and that most of the files that I open will auto open in pages even if they are originally word documents. I also like that it is fairly easy to save the files as pdf or other types of files. There use to be a notebook view and with one of the most recent updates, it is gone. (Unless I'm thinking about Word for Mac instead of pages). I also have a hard time finding the mail merge feature and the ability to print mailing labels, postcards, etc. The ease of use with pages is one of the best attributes of the product. I love how easy it is to add media, text and create beautiful templates for all different kinds of publications. The ability to create designs and place text in any place on the page helps to make the publication your own. I love the fact that there are so many choices in font and media styles. I love that you can create text in front of or behind any media source. The help center does not give the user the ability to ask questions on a live basis. I most of the time have to find my answers to questions on my own, while using a different web sourced program such as google. When exporting and changing documents that have been exported by others, I would like to see more recognition of fonts and colors so that the transition from one program to another is more seamless. It is a great interface that has helped me create content for non profit and for profit companies. The ease of use with the ability to export into any file type has made it seamless while working with other people that do not have Pages or have not used it before. I am creating simple and beautiful publications that allow those around me ease of use. Wether collaborating on something together or creating something specific for someone, it gives me the ability to do what is needed to meet the goals and objectives of my needs. Pages is the first program I open and it stays open. It is simply the best word processing program for Macintosh, period. It's extremely fast, and I especially love the export options (PDF, Word, plain text, ePub, etc). Another great feature is its wide selection of templates to choose from. I honestly can't think of a thing I dislike about Pages. I use it every single day. It is the first program I open and the last one I shut down. It's not buggy and I can't remember a single issue I've had with it. Don't waste your money on more expensive word processing programs. Pages is all you need. As a web designer and developer as well as a graphic designer, I can tell you that it fits the bill completely. For a word processing program for the Mac, it simply doesn't get more efficient or easier than Pages. It is the only program you need. You can open Word docs and more. It is a fully featured word processor and the little to no learning curve, makes this the best word processing option for the Mac. Pages is very user-friendly and intuitive. It's easy to set up your own templates, and it doesn't feel as clunky as Word. Exporting to other file types is easy, as well. It's much more difficult to place images the way you'd like to in Word. This is probably due to the fact that Mac offers other software that offers that functionality. But as just a word processor, it's really great. But it can be quite annoying if you have multiple users running different versions of Pages because sometimes files created in a newer version can't be opened by those running an older version. If you want to use Pages, be sure you've got your entire team running on the same OS version and the same version of Pages. Otherwise, you will likely encounter compatibility issues. Also, if you use Google Docs frequently, it may not be the best option for you because Google Docs will not automatically convert Pages files to Google Doc files. And exporting to Word from Pages can sometimes cause formatting problems. Creation of internal documents. Even though I really love the software, we've had to move away from it as a company because of the issues with older OS and versions complications. "I use Pages over Word 99% of the time... here's why!" The best thing about pages is you're not stuck with horribly done pre-set formatting! I was, like most, raised using Word as my go to word processor and have since changed my mind about what I think is good and bad about using Word over Pages! I really don't have much to say about "not liking it" the only thing that I don't like is that some websites don't allow for the pages documents to be uploaded and you then have to convert to a Word Doc or PDF and either way it's one more step that could EASILY be fixed by them allowing for the Pages extension universally like a Word Doc... it's like the Y2K problem where you should have just programmed computers to use four numbers instead of two anyway! If you do anything online for marketing, for your website, for yourself, it will be MUCH easier to use Pages to get the job done easily and without the hassle of dealing with pre-formatted craziness that is Microsoft Word! We do a lot of blog and newsletter writing and it is much easier to copy and paste something from Pages in to a content management system like WordPress because it does not pick up all the hidden formatting that is built in to Word Documents. You can of course, copy and Paste and match style, within most operating systems and browsers, but why make it so complicated? "Bye Bye MS Word... for good"
The management of templates, pasting graphics straight from the internet, the "magic" tool to delete backgrounds, easiness to increase/decrease font sizes, the organization of the inspector... it's so SUPERIOR that I forgot about word a long time ago. Although it comes FOR FREE with new macs! I hated and still hate how hidden it is the highlight tool. Also it needs more compatibility improvements. Other thing that needs to improve or at least I have not found the way to do it, is customize the tool bar, so If I could customize it I would place on it the most used tools like highlighting text. Also I'd like it to improve the ability of assigning quick key combination to specific tasks like highlighting text, changing style and inserting a page break. Other thing that can improve is to let users move the pages on the quick view (left bar) to move sheets up or down like in Keynote. It will take some time to get used to it, but when you take full advantage of its possibilities, you will just love it. * We monitor all Pages reviews to prevent fraudulent reviews and keep review quality high. We do not post reviews by company employees or direct competitors. Validated reviews require the user to submit a screenshot of the product containing their user ID, in order to verify a user is an actual user of the product. Hi there! Are you looking to implement a solution like Pages?